Fall is a great time to go out hammock camping: the cool, refreshing air, devoid of biting insects, is inviting (yeah! no bug net!). Plus, seeing the vibrant foliage and listening to bugling elk in the meadow is breathtaking. Several of my Boy Scouts are talented hunters and we often enjoy early mornings “calling in” elk, deer, and even coyotes who will wander in close to our camp. Speaking of hunters, this time of year is not devoid of certain risks. While there may be hunting throughout the year, fall tends to be the time that big game is in season and when hunters are out en masse. For great tips on hiking safely during hunting season in general, I highly recommend the list prepared by the Appalachian Trail Conservancy. As this is a blog about hammock camping, I wanted to highlight a few points related to this hobby, but may also be applicable generally. I address “stealth camping” in my book because it is a very popular option among hammock campers. In a nutshell, stealth camping emphasizes muted colors for tarps and hammocks and pitching in secluded areas. This is a great Leave No Trace technique to minimize impact in an area and to be considerate of other visitors. Camouflage and woodland earth-tone colors are very popular with hammock campers for this reason. But during hunting season, it’s advisable to be cautious and be seen. This doesn’t mean you need to go out and buy a blaze-orange tarp (my eyes are hurting just thinking about that), but adding a stripe of color to your tarp or some reflective ribbons will help raise your visibility. You might want to reconsider bringing that tarp with the nature scene painted on the side this time of year. Bringing your best camo tarp or woodland scene tarp is not the best idea during hunting season (photo courtesy fieldcandy.com). Along with picking the appropriate colors and designs for tarps, picking your site is closely related to increasing your visibility during hunting season. Backpacking with my hunting friends, I’ve learned a lot about game trails, hollows, and draws that are magnets for game. It may be best to avoid some areas even though they may be the best for minimizing temperature inversions or wind for hammock camping. Even during non-hunting times, you should avoid camping too close to water sources (LNT recommends staying at least 200 ft/61 m). I often check with my hunting buddies to find out what areas I should avoid due to elk and deer movements (I’m lucky to have a few hunting guides as friends). You can also check with your local game and fish agency for specific information and guidelines. 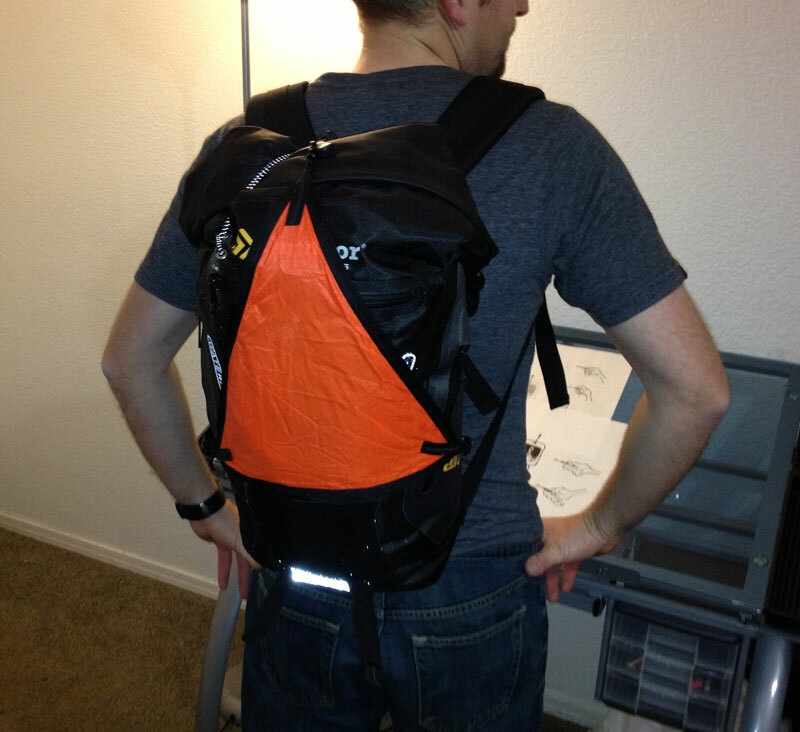 You don’t have to be a lightweight backpacker to appreciate multi-use gear. One of my favorite gear options this time of year is a pair of Triangle Adapters from Arrowhead Equipment. I asked Paul for a set made from blaze orange. The nice thing about these under quilt adapters is that the adjustable shock cord makes it easy to attach this accessory to my pack. The triangle shape is also a recognizable symbol that adds some cognitive dissonance out in the field that may improve your visibility. However, some states (notably Pennsylvania) have specific requirements about how much blaze orange you have to display, so this triangle might only be part of your “see me” strategy. Webbing Straps—Buy a set in bright orange just for hunting season. Instead of packing them, wrap them around your pack or your arm. When not hiking, these visible straps help highlight your camping spot. Weather Shields—Like a pack cover for your hammock, Weather Shields wrap around the under side of your kit to protect against “splash-ups” from the ground and also add a few degrees of warmth. Jacks “R” Better sells Shields in a few colors and also provides a do-it-yourself instructions (+kit) so you could make a version in brighter colors. Properly modified, these shields could double as ponchos or pack covers to provide additional visibility. 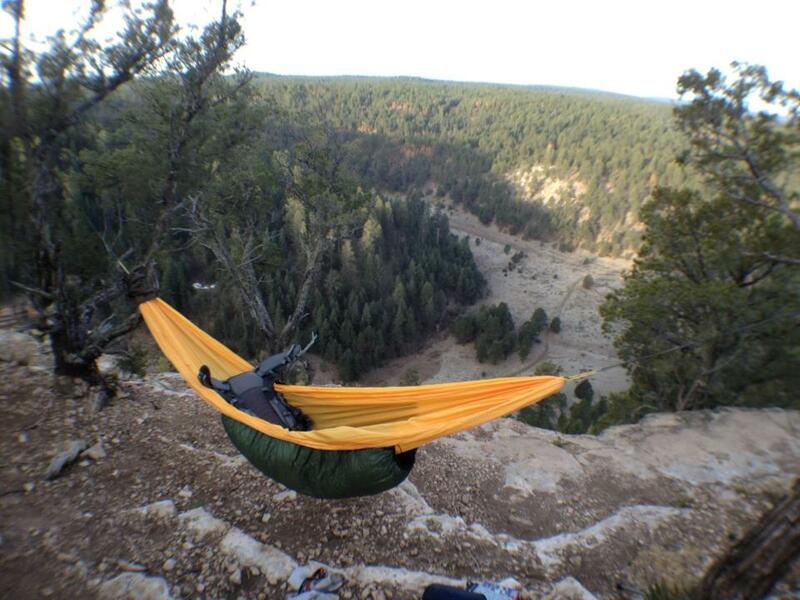 Gear Hammocks—Jacks “R” Better also sells a gear hammock that also doubles as a pack cover. You can order this in blaze orange (bonus! ), so it can triple as a visibility option. Regular Hammocks—Yes, you can buy hammocks in bright colors, and you may be a proud owner already! If not, there’s nothing wrong (and everything right) about adding to your hammock collection, especially if it adds to your safety (that’s a great selling point if you have to negotiate with a significant other for funds). I like the orange/yellow hammock from Ticket To The Moon, but you’ll find a variety of bright color options from most manufacturers. I’m also a proud owner of a blaze orange hammock from White Mountain Outdoor Products. It’s comfy and BRIGHT! Stay safe out there and enjoy the season!